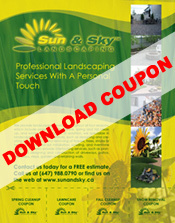 Thank you for your interest in Sun And Sky Landscaping. For general inquiries please email us at info@sunandsky.ca or call us at (647) 938-2316. For a FREE quote please fill out and submit the form to the right.